One of the best things about the tournament like Clash of Kings this year was that there was quite a number of new players attending and who traveled far to participate. My first impression was that there were some similarities between this force and the army Mark brought to my game 2 of the tournament. The strong shooting was represented by horde of Crossbowmen, also equipped with Heart-seeking Chant for extra punch. The Chariots, being nimble due to Wine of Elvenkind artifact, also added to the potential of ranged attacks substantially. Like Mark, Marcus also brought two Dragons but unlike the Kindreds version, they come with Lightning Bolt (5) which makes them very flexible and allows them to hit the enemies from further afar. Of course, they are also very strong in melee and highly maneuverable too. The army had some very melee orientated units in the form of the Dark Knights and Reaper Guard regiments. The Chariots also added here because 18 Attacks with Thunderous Charge (2) is very good, especially against smaller units. In addition, there were two units of Gargoyles that are excellent units that can fill multiple roles. They can screen the advance, intercept the enemy units but given the opportunity, can hit hard enough to rout their foes. Last but not least there was Ba'su'su! Another very dangerous and extremely maneuverable flier. Hence, there were three fliers I had to deal with and each one of them was very dangerous on its own. If they combined their efforts they can easily rout any of my units with the frontal charge. When I looked at potential advantages I noticed that in some cases I may still have speed advantage. For example, both Chariots and Knights are slower than the counterparts in my army. I also tried to learn from my previous games and I reminded myself that my own shooters can potentially start from the distance that would not allow Crossbowmen or Chariots to shoot at me even if they moved but I could still get into range. Such maneuver would not guarantee an immediate success but would help to avoid early casualties and start doing the damage to horde units. Hence, the general plan was as follows. 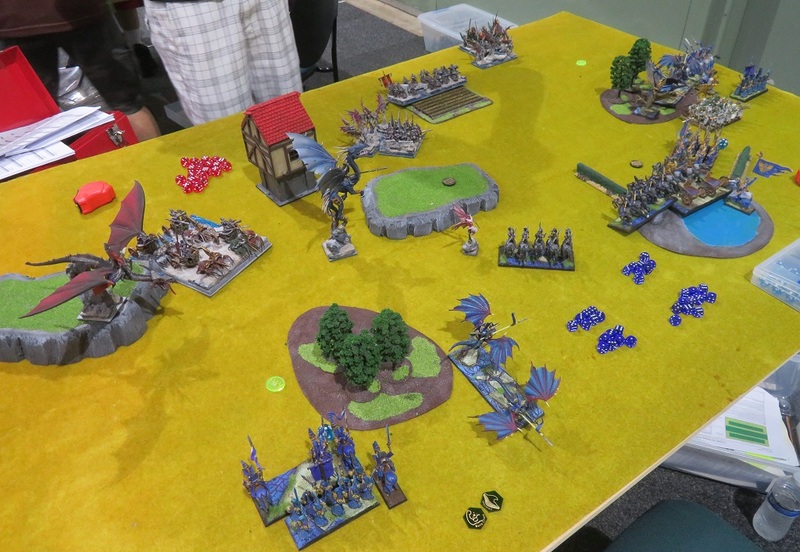 Unless Gargoyles are a viable target (and I didn't count on that) I would stay outside of range of Crossbowmen and Chariots with my own shooters and move in turn 1 to attack them as a priority. I wanted to maneuver to have some elements to be able to charge these units turn 2 in order to distract them but with some damage done in turn 1 I may have a chance to create bigger confusion. 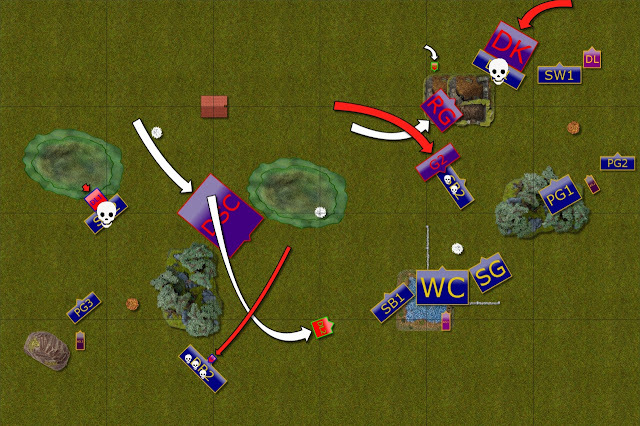 I decided I may either spread my formation or at least leave substantial force on one of the flanks to avoid getting into each other way as I did in my first two games. At the same time, that force was to distract any flanking force Marcus was to set across them. The rest of the army would need to create opportunities to engage and destroy some of the units they faced, depending on the circumstances, i.e. 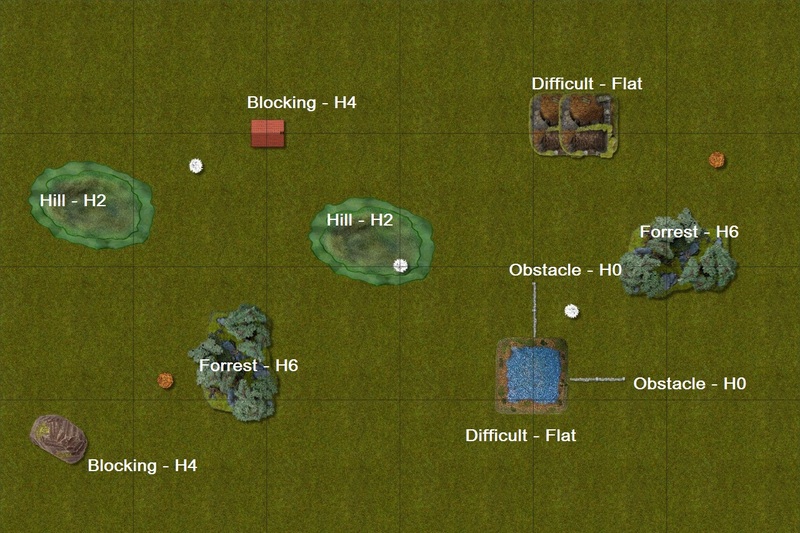 terrain, scenario and exact deployment of enemy units. Terrain details and positioning of the objectives. We were about to play Occupy scenario so we had to place objective markers first. The white ones on the map are secondary ones - worth 1 victory point each, and the orange ones were primary objectives - worth 2 victory points each. 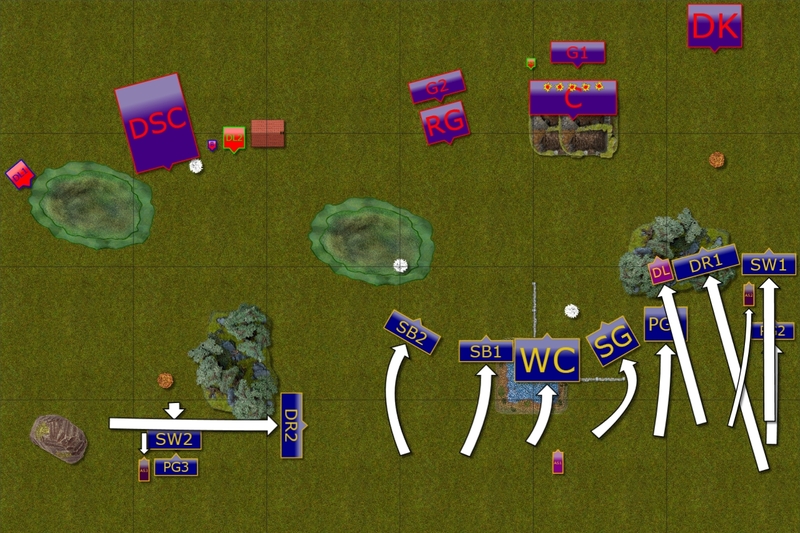 According to the scenario rules we placed one objective in the center, then 1 secondary each and next 1 primary each. I thought that spreading the objectives would be a good thing for me as it would present Marcus with a dilemma. Either to spread his less numerous force to cover all of the objectives or to tighten the formation and give up the control over some of them. 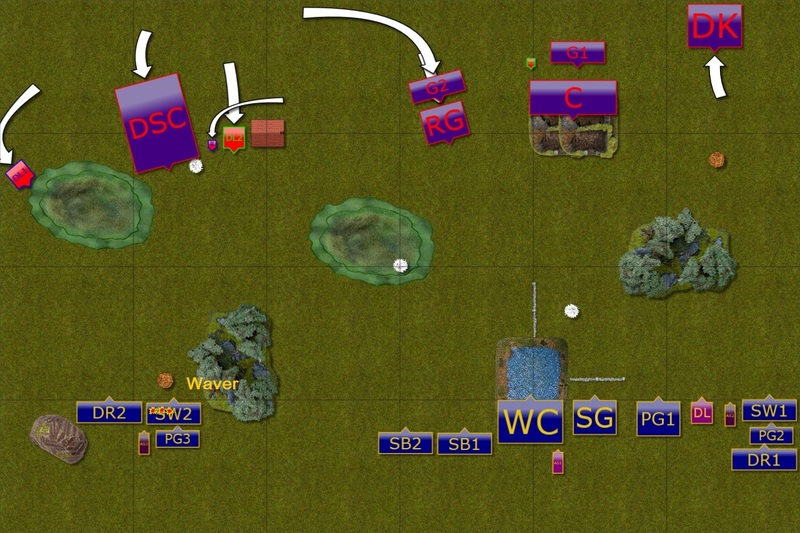 At the same time the scenario seemed to help with my initial plan for deployment. I chose my left flank to have the majority of the units because it had better defensive terrain I could use to anchor the group. I did risk and position some of my shooters there despite being in range of Crossbowmen but they had to move and shoot at the target in cover so that should limit their efficiency. 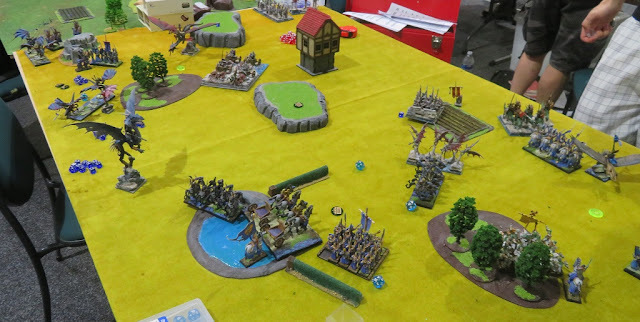 When I noticed that both Dragons and Basusu are on my left flank, I also reinforced my right flank with Drakon Riders and Drakon Lord to help with attacking the Crossbowmen and at the same time put pressure on slower Dark Knights. The group on my left had a tough task to distract and occupy powerful elements of the enemy. However, the fact there was an objective there was an additional motivation to attract the attention of the Dragons. 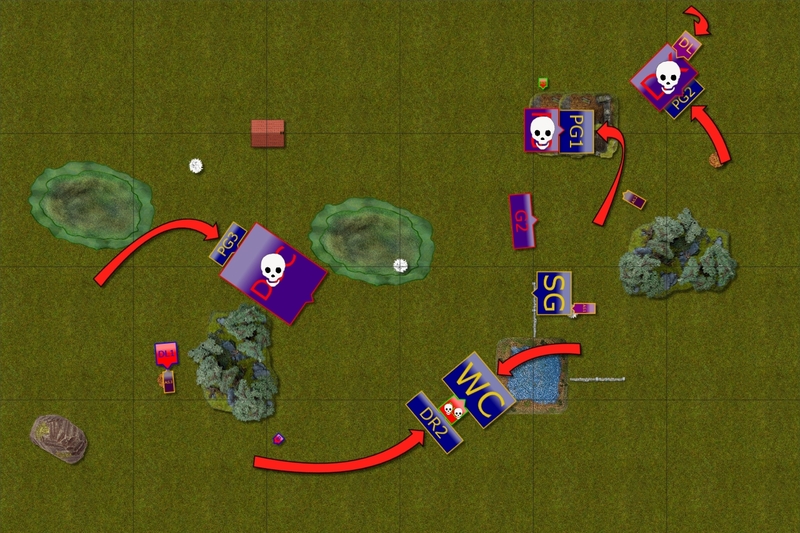 I thought that I would most likely lose that flank but if I managed to delay the advance of the dragons and prevent them from immediately controlling the objectives, I should have a chance to win on the right and hopefully have more elements left to try and capture the middle objective to fulfill the scenario. 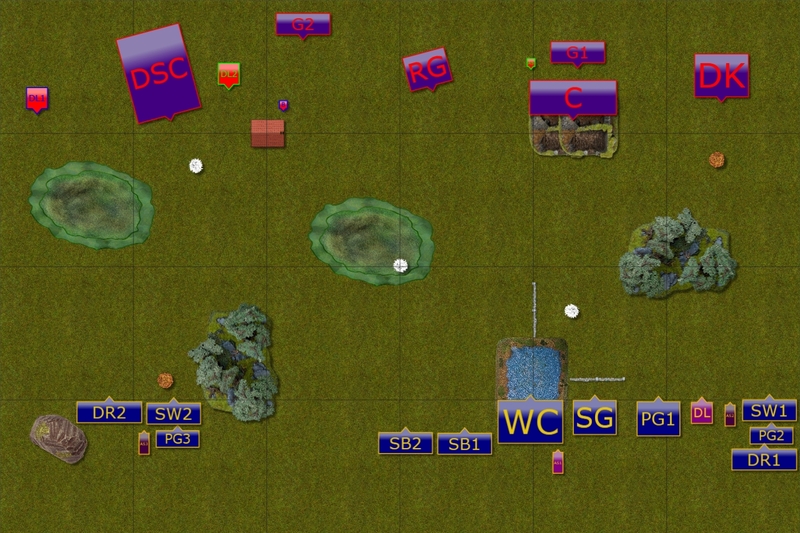 Another factor I tried to include in the plan was that there were 8 scoring units in Marcus army so if I managed to rout at least 4 of them then he could have not been able to control all of the objectives. Marcus won the roll off and chose to move first. 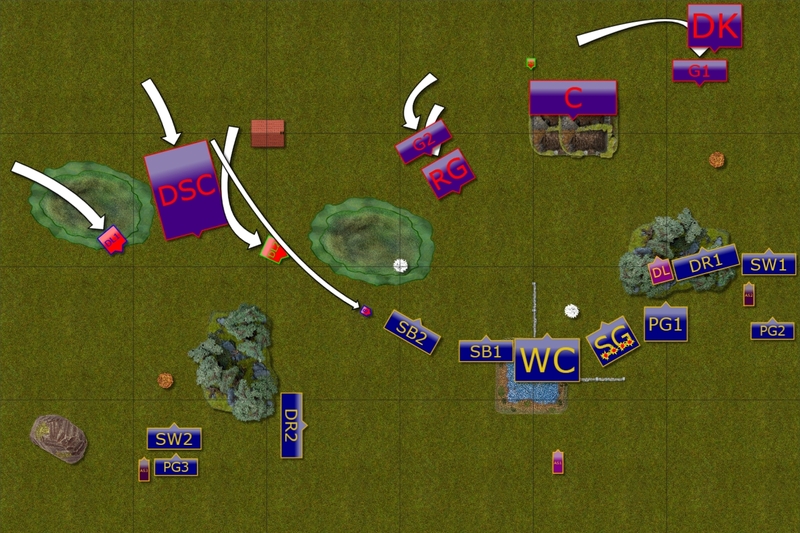 Advance on the left flank. Twilight Kin forces moved on the Western flank and unleashed their ranged attacks at the first target - Storm Wind cavalry. Considering the sheer volume of the attacks it was a miracle that Elven Knights survived it. However, they were quite shaken as a result. 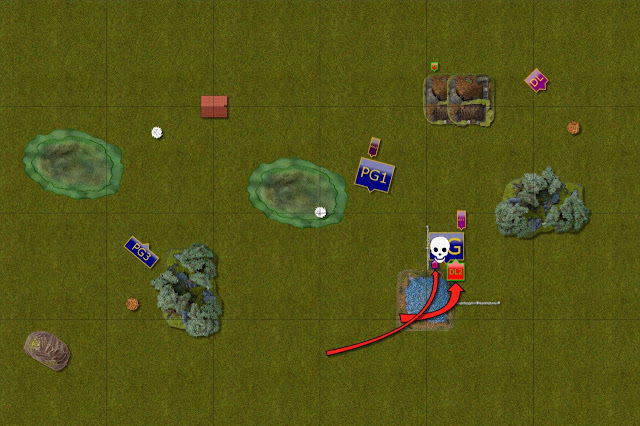 The units on the Eastern flank didn't advance much, only Reaper Guard with Gargoyles moved forward. Outcasts advance on their right. 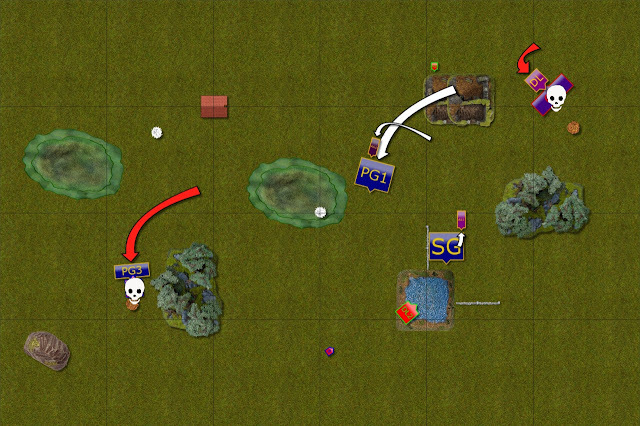 The Outcasts moved forward and started implementing the battle plan. The shooters all aimed at enemy crossbowmen and while the efficiency was limited by the cover, some damage was done. At the same time, the fast units moved forward to get ready to attack Dark Knights while Palace Guard followed using the forest as a cover too. On the opposite flank the units had to pull back to avoid being charged and keep the enemy distracted. Drakon Riders feigned the retreat to the center in order to draw the enemy towards them and to stay out of range of Lightning Bolts. The shooting duels continued and Twilight Kin units started spreading their fire between different targets. On the West the Dragon once again tried to rout Elven knights but this time the lightning bolt was very weak and Storm Wind cavalry emerged intact. On the opposite flank Crossbowmen also attacked and chose Sea Guard as a target but have not inflicted enough damage to rout that unit yet. Taking the fight to the enemy. The Outcasts decided it is time to strike. 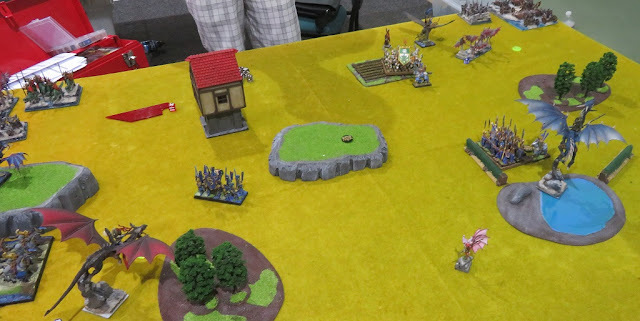 The first unit to attack was battered Storm Wind cavalry who valiantly charged one of the Dragons to slow down the beast at least for a while. Nearby Palace Guard moved to the flank to keep that Dragon distracted. 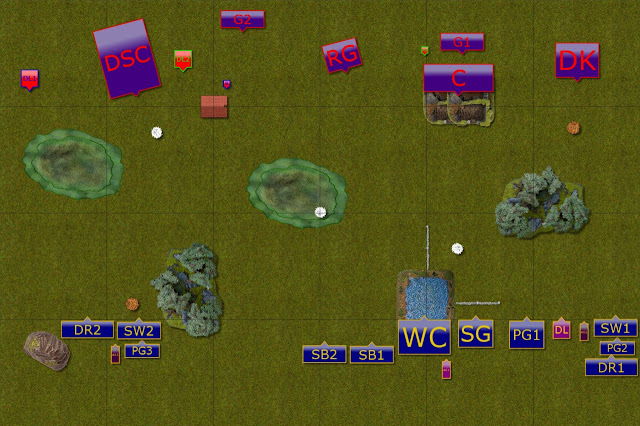 On the opposite flank the attack was performed by a few units simultaneously. Drakon Riders spotted a perfect opportunity and charged the Crossbowmn from exposed flank. As a result of that unexpected attack the Twilight Kin unit routed! Storm Wind cavalry destroyed the Gargoyles and all would have been perfect but the Drakon Lord completely failed in his attack and didn't even do any damage to the Dark Knights! 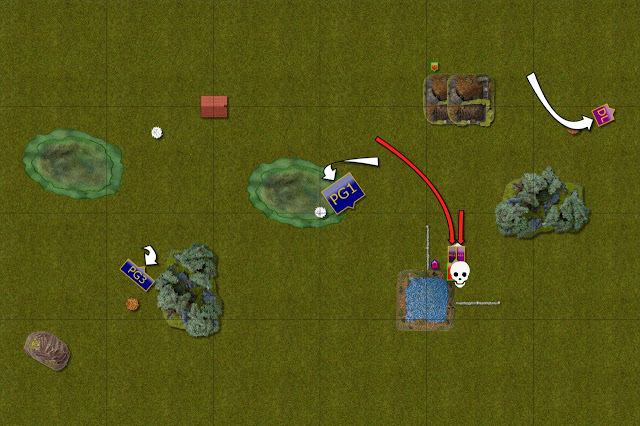 At least the shooters could improve the situation a bit as they all aimed at Reaper Guard, now in the open, and inflicted some damage. Twilight Kin units exploit mistakes done by their enemies. Twilight Kin units spotted their own openings and charged to enact revenge upon their hated foes. Dark Knights now had a perfect opportunity to attack Drakon Riders from behind and did not hesitate to do so. Nearby Gargoyles also had a nice flank charge but they failed and did not even rout their enemies. Basusu had many targets to pick and chose Drakon Riders as they were alone and without much support. Stubborn Elves managed to survive the initial attack though. 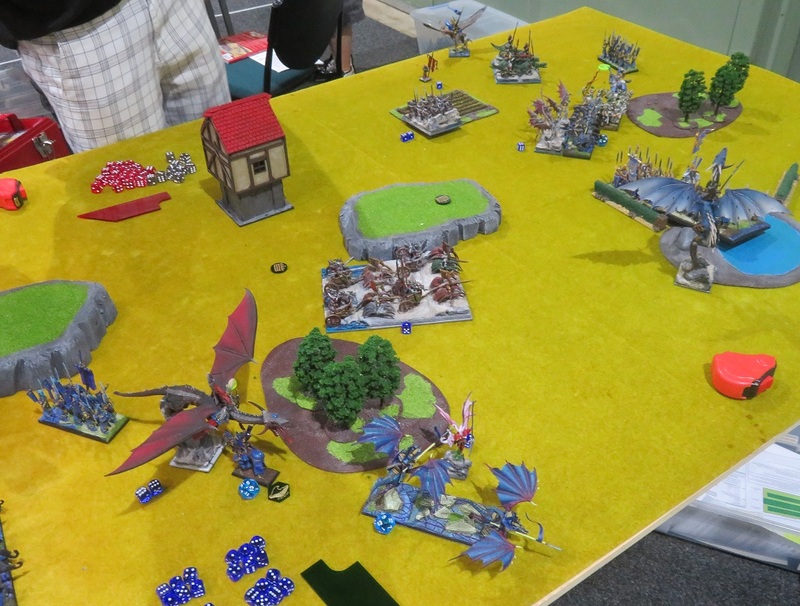 Last but not least, one of the Dragons destroyed Storm Wind cavalry but the charge momentum did not carry it far enough to avoid Palace Guard on their flank. The fight now broke into few, individual combats the results of which would shift the scales in the favor of one of the armies. Palace Guard on the Western front fearlessly attacked the Dragon and inflicted further damage, the beast was seriously wounded now. The Drakon Riders had no option but to charge Basusu but they got lucky and stunned the creature! Silver Breeze was assisted by Palace Guard regiment but somehow they failed to rout Gargoyles too! Finally, Storm Wind cavalry attacked the Dark Knights to keep them in place and allow other units to charge them soon after. Both Dragons attacked their chosen targets but while one easily defeated the Silver Breeze cavalry, the other failed to kill lone Army Standard! Fortunately, Gargoyles and Dark Knights routed one enemy unit each. In order to tip the balance into their favor the Outcasts had to hit their enemies hard and fast as protracted combat would destroy any hopes for the victory. And so the units coordinated their attacks well and hit hard. 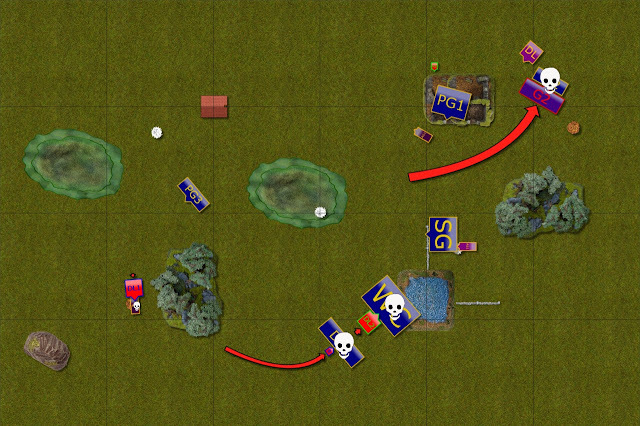 Palace Guard managed to catch the Chariots by surprise and destroyed the unit with a timely attack from the most dangerous direction. Their companions in the opposite corner of the battle field also succeeded in routing their enemies, damaged Reaper Guard and Dark Knights. More casualties on both sides. Despite substantial losses Twilight Kin was still combat worthy and proved it by striking back. Enraged Dragons destroyed their targets this time while Basusu helped to get rid of the Drakon Raiders he failed to rout earlier. Even Gargoyles managed to hit hard enough to rout Palace Guard troop! Outcasts reform to defend their positions. 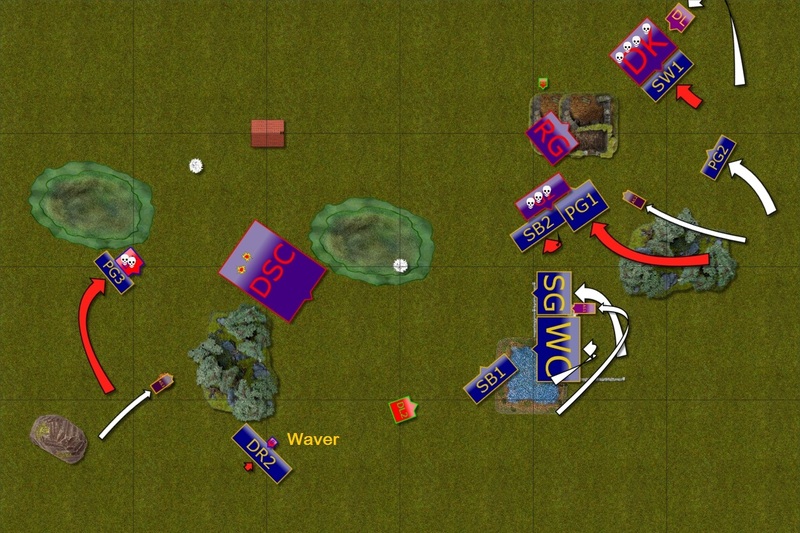 The battle was entering a decisive moment. Both armies were badly damaged and with very few units left to continue the fight. The Outcasts had to keep pressing against all odds and there was still a chance to carry the day. Palace Guard had another chance to attack the Dragon and this time they managed to kill the beast! 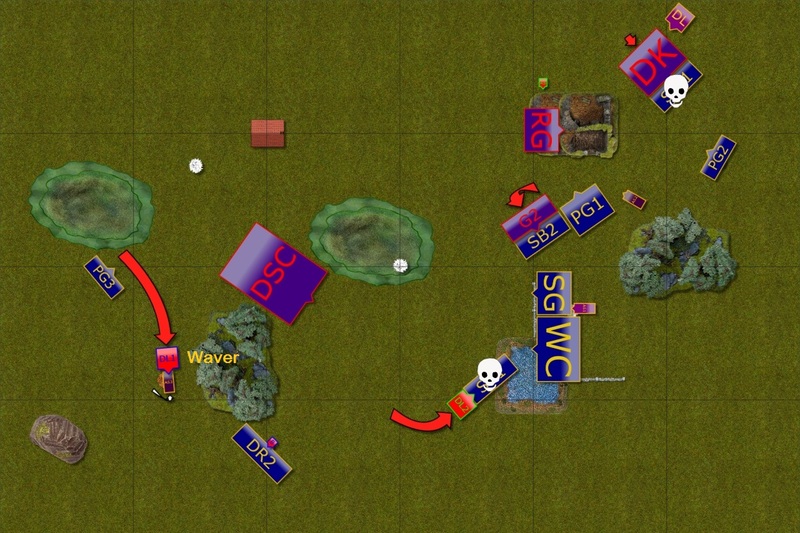 Their companions rushed towards the center of the battle field to claim the objective there while Sea Guard reformed to face the second of the Dragons. The Elves tried to shoot at it but all arrows were deflected by its thick skin. Finally, Drakon Lord got rid of the annoying Gargoyles and controlled another objective. Sea Guard is no more. Basusu and the Dragon claim another victim. With only 2 fighting elements left and too many enemy targets, the Dragon and Basusu teamed up against one of the enemy units. Sea Guard fought bravely but as they have already sustained damage they could not hold their ground against two beasts at the same time. Glorious charge of the Army Standards! 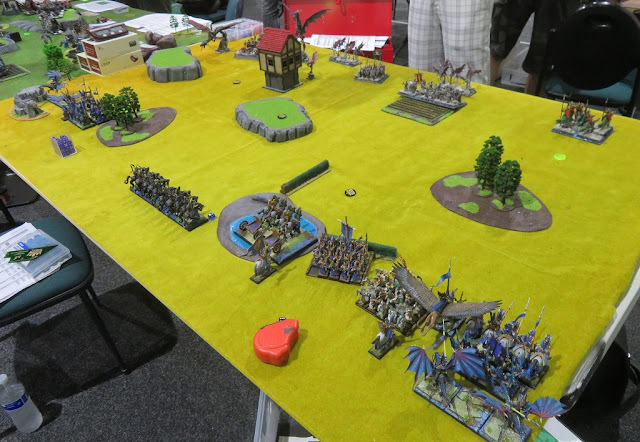 Palace Guard units and Drakon Lord were too far or out of position to attack remaining foes so it was up to two Army Standards to charge the badly wounded Dragon. Somehow they managed to inflict that one last wound to kill the beast and claim the victory for the Outcasts! Many thanks to Marcus for a great game! I hope he enjoyed it despite the end result that does not reflect the fact that it was a very blood affair and could have gone either way. 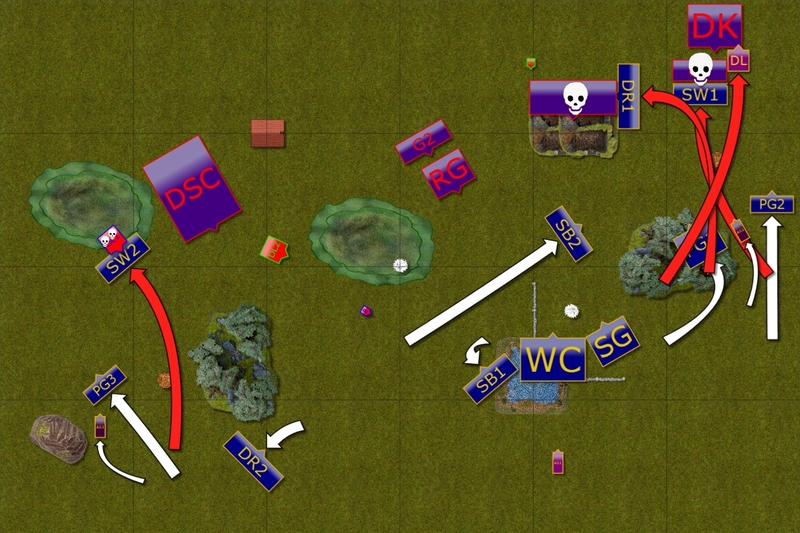 We both had our share of the mistakes, good or bad luck and perhaps the attrition score is what properly tells how vicious this battle really was. I lost 1420 points while Marcus had 1710 points routed. 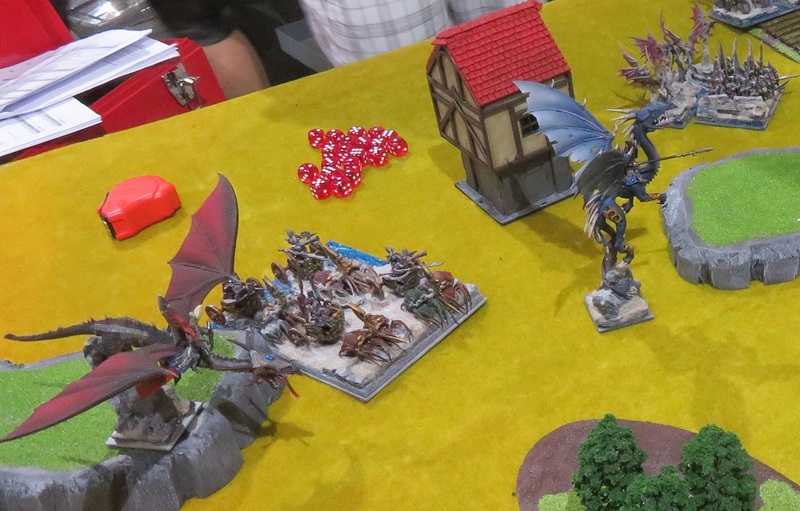 It looks like if not forthat last charge against the Dragon it would have been quite the same amount of points! I am glad I managed to get a victory after such a brutal fight. It was a challenge to play against the army with very good fliers and strong shooting component but this time, at least in general, my plan seemed to work a bit better. I mentioned I made some mistakes and they were quite costly. First of all, while I could not predict my Drakon Lord is going to completely fail to inflict any damage against Dark Knights, I should have advanced with Storm Wind cavalry to block them and keep the Drakons safe. Instead, I lost 2 units in the process and could not use them elsewhere. A second mistake was to expose the flank of Silver Breeze to gargoyles but I was trying to avoid the big fliers and not let them attack this unit and get closer to my lines. So I accepted the situation as I didn't think I can come up with good idea at the time. I should probably deployed my units on the left flank further back, if only to avoid being shot by the Chariots on turn 1. I got lucky Storm Wind was only wavered. Similarly, the plan was to avoid being shot at by the Crossbowmen but this time I didn't suffer the consequences. Once again, many thanks to Marcus for a great game, I hope he will be bringing his beautiful army to the events more often now and that he enjoyed his first tournament. Always nice to read a TK report, especially with an army that was quite similar to what I used to run. I thought you both played well. He did a great job for a newer player and hopefully he enjoyed the tournament and plans to continue making it out for games. It’s always good to bring new players into the fold! You mentioned that you should have covered the drakon lord even though he had a low chance to do no damage. This is something that I struggle with as a player and definitely something top table players are able to do, so I’ll try to pay more attention to that in my future games. Especially instances where you have the ability to move a unit to a location to help if the worst occurs. Occasionally, you may have to make a move like that with no back up if it is mathematically the correct play. But it is definitely a good lesson to keep in mind! Thanks for the comment and sorry for the delay in replying! 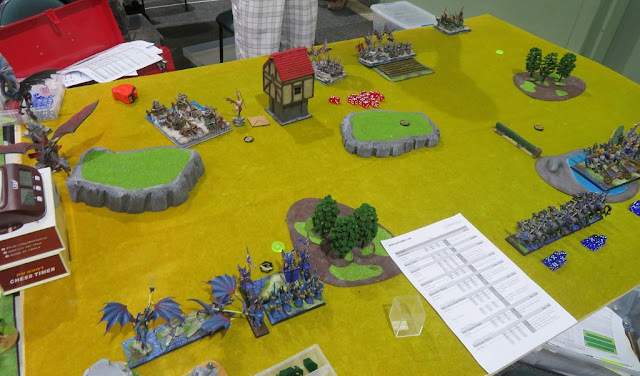 I hope Marcus enjoyed the game and the tournament and I am told by one of his team mates (Marcus played as a member of Team Shed :)) told me all the new participants from their team continue playing KoW! I admit it is difficult to remember that one should have some contingency plan in place in case of unlikely but still possible events. Like this one or double 1's roll for nerve. That is also one of the advantages of the battle reports where you can clearly see what could have been done to prevent unnecessary losses or even the situations where suddenly your victory turns into defeat. Nice and intense game! I like those moments like that last turn, they're just fun to imagine, the standard bearers raising their flags high as they just straight up charge at a dragon. i do enjoy the strategy of these games, but i really love those moments too.